As one of our many flight partners, Thomas Cook play an integral part in our mission to get golfers onto fairways around the world. This world-renowned airline helps golfers reach fantastic winter sun destinations like Tunisia and Canary Islands, as well as jetting to favourites like Spain, Portugal, Turkey and the US. 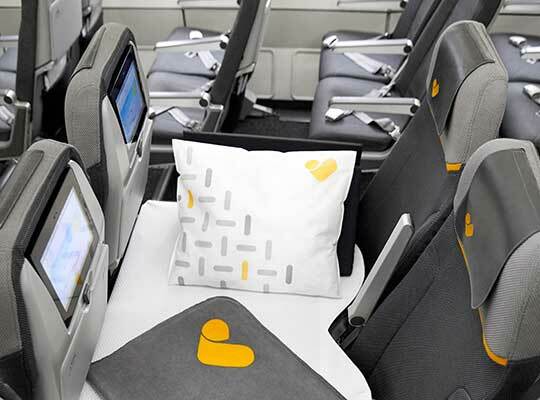 Offering free club carriage on return flights, Thomas Cook are a great choice for your next golf holiday. To plan your perfect golf holiday speak to our dedicated Specialists now. 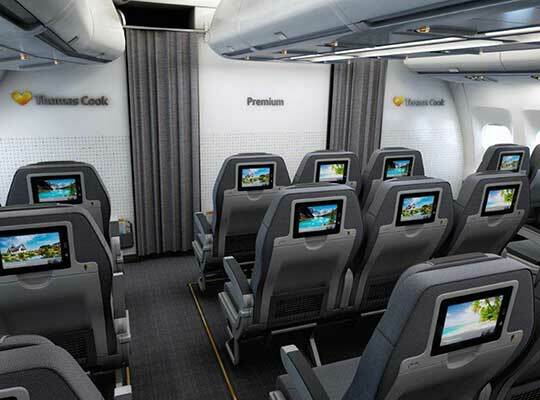 When flying economy Thomas Cook ensure you always arrive at your destination refreshed. Pre-booking your in-flight James Martin meal, complimentary on long haul routes, is advisable and with vegetarian, vegan, diabetic, lactose-free and gluten-free options on offer they cater for all dietry requirements. A good selection of soft and alcoholic drinks are available for purchase on board while the large selection of TV series, music and latest blockbuster movies is sure to keep you entertained. Earphones are available, free of charge, on request but you are free to use your own too which will be compatible with the seat-back screens. Start you holiday off in style by flying Premium Class with Thomas Cook and indulge in the extra touches of the Premium James MArtin meal or priority boarding. New Premium seats have been introduced to make you journey more comfortable along with extra space in the cabin. Seats are now 19.7 inches wide with a 35 inch pitch and up to 6 inches recline along with adjustable head & foot rests, a USB port and a personal in-arm tray table. Watch your favourite classic movies, hit TV shows and listen to various radio channels with the in-flight entertainment on-demand system.